The means by which the foundation and basement plumbing will be drained requires careful planning, particularly in areas without sewers. 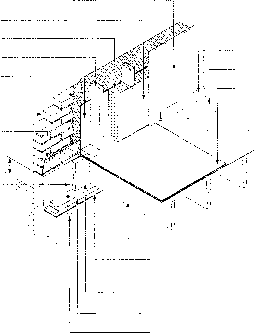 Foundation drainage m;-iy consist of weeping tile or a granular drainage layer, or both. When the house is located on a site where gravity drainage of The foundation is possible, a sump pump is not required. However, in flat or low-lying areas without storm sewers, a sump pump will be required lo pump the water to a ditch or dry well. In areas with storm sewers, it may also be required when the foundation drainage lies below the storm sewer. Always check with the building department for local requirements regarding foundation drainage and basement plumbing. Avoid leading water trom roofs and driveways into the foundation drainage system. Drain this water away from the house. -+ Use gravity drainage of foundations and basement plumbing in areas without municipal sewer services whenever possible. Plan the location of the building and septic system accordingly. -* Plan site drainage to divert water away from wells and septic systems. Only use sump pumps and sewage ejectors with tight seals to avoid odours and soil gases from entering the dwelling. Never combine the- use of a sewage ejector as a sump pump when it is connected to a septic system. The waier will dilute the effluent in the septic tank and impair its proper digestion. Consider the location of any other services entering at or beneath the foundation to avoid conflicting interference. Refer to the Eavestroughs and Downspouts chapter for more information on dealing with roof drainage. Ihe Surface Drainage, Driveways and Walkways chapter discusses options for draining r unoff. compacted to the appropriate density before the next lift is placed. Care must also be taken to ensure that externally mounted insulation, drainage material, dampproofing or waterproofing membrane are not damaged. Foundation insulation provides a means of reducing the heat loss of the building. Depending on the approach taken, foundation insulation can also provide other benefits, such as acting as an exterior wall drainage layer. The requirements for basement insulation vary from province to province. Check with the local municipality for the local requirements. Foundations can be insulated on the interior or the exterior of the building. Interior insulated basements may be partially insulated with insulation extending 2 ft. (600 mm) below grade or full depth. Interior basement insulation often requires installing framing to support the insulation and the interior finish. This approach creates a finished basement space that often adds to the habitable areas of the house. Insulating the basement from the outside provides its own advantages. The insulation often can also provide wall drainage offering additional protection while reducing heat loss. Exterior basement insulation also reduces the temperature swing that the foundation wall experiences, which often reduces thermal stresses and the cracking that sometimes results. The disadvantage of this system is that the insulation often requires protection because it extends above grade. Houses with a crawl space are supported on a foundation wall that is carried at least 6 in. (150 mm) above the exterior finished grade. Trenches are dug for the foundation walls and the footings placed at a depth below grade determined by soil conditions and frost penetration (see Table 3). The sizes of the footings are generally the same as those used to support basement walls. The foundation walls may be built of concrete, concrete masonry units or preserved wood, but since the inside grade is never much lower than the outside grade, the thickness of the foundation walls is usually less than those enclosing a basement. Table 1 shows minimum foundation wall thickness for stable soils. Footings for columns supporting the floor beams should be placed on solid undisturbed ground, and this may require some excavation. Concrete, masonry or preserved wood columns are generally used to support the beams. The excavated area is backfilled around the base of the columns and footings when the crawl space floor is leveled. Crawl space insulation, which can be installed either at the perimeter of the foundation or in the floor frame under the living space, is discussed and illustrated in the chapter on Thermal Insulation. Where the crawl space floor is below the level of the outside finished grade, the foundation walls should be damp-proofed, Drain tile is then installed around the footings and connected to a drain. The floor of the crawl space and access trenches is graded toward the drain, and a ground cover of 6 mil (o. 15 mm) polyethylene or Type S roll roofing is installed over the surface with the joints lapped at least 4 in. (100 mm). The ground cover prevents ground moisture from entering the crawl space area. The crawl space should also be ventilated. See the chapter on Ventilation.